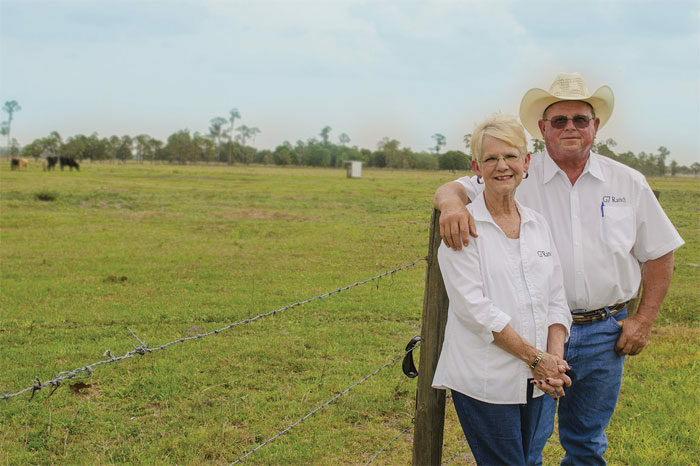 CATTLE RANCHING in Florida has a long and storied past that may surprise you. The first cattle were brought here with Ponce De Leon and the Spanish explorers in 1521. Those seven Andalusians were likely the ancestors of the Florida scrub cattle that later became the herds of both Seminole natives and pioneer settlers. Fast forward to today on the G7 Ranch in Lake Wales, and you can meet cattlemen Dr. Robert “Doc” Gukich. Known simply as “Doc” by neighbors and friends, he has been in ranching since he was a kid on his grandfather’s ranch. As a youngster, Doc was inspired by an uncle who earned a doctorate in reproductive physiology. That uncle eventually took over a breeding program for U.S. Sugar in the 1980s. This sparked an interest that ultimately led him to become the first veterinarian in his family. From the very beginning, his interest was in the cow-calf, food animal aspect. That lifelong interest in a specialized field has led Doc to apply the principles of veterinary science to the animals on his ranch. He knows the importance of good health in his cattle, from the point of conception to the point of consumption. Proper feeding and nutrition during pregnancy and post-calving is imperative to produce a final product that is of a quality highly desired by consumers. So how did The Gukich family and G7 Ranch become a founding member of the Florida Cattle Ranchers? Doc was at a meeting in Kansas one day when he first heard the idea for a similar cattle ranchers’ association. That was the moment he knew this was the type of project he wanted to be a part of. “After the conversation,” he recalls, “I decided if we ever started anything like that in Florida, I wanted to be a part of it.” Several months later it was presented as a possible company and Doc was on board, along with 13 other fellow founding members. The goal of the group is to complete the cattle cycle in-state, from conception to consumption, minimizing the necessity of shipping cows out of state for portions of the process. Many consumers don’t realize that although Florida has long had a strong cattle industry, not all of the life cycle was taking place here. The FCR seeks to change that by influencing the way the cattle are raised. As ranchers share tips of the trade among each other, they are also passing these traditions down to the next generation. Doc’s oldest grandson (out of six, so far), is 12 years old and gets right out there and lends a hand any way he can. This is exactly what Doc envisioned when he bought his first 500 head of cattle — a lasting tradition that he could pass on to his children and grandchildren. “He rides with me on the weekend, he comes out to the pens and watches us work cattle,” he describes. “I’ve taught him how to give shots and how to put brands on calves and cows.” Another important role that the kids play is in sharing the information they learn with other children. In the future, the group will engage directly with the public through various outlets to inform about FCR beef and why it’s important to preserve the tradition of cattle raising in Central Florida and throughout the Sunshine State.